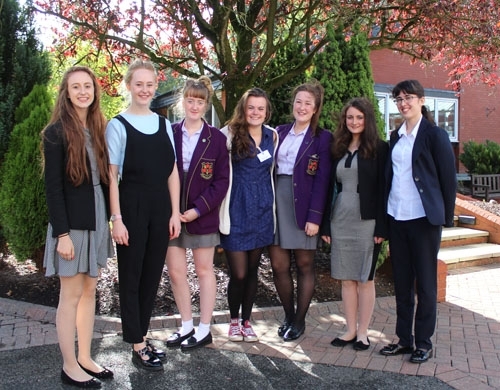 We were delighted to welcome back former student, Sophie Ward, who spoke to some of our students about the ‘real Oxbridge’. Sophie is currently studying Bio Medical Sciences at The Queen’s College, Oxford and returned to School to share her experiences to students who are considering applying for Oxbridge. She explained that what really matters when applying to Oxbridge, along with results, is that you must have a real love for your subject. Sophie spoke in great detail about how the University surrounds are “amazing” and that the one to one teaching is “world class”. Sophie loves the social side to life at Oxford; when she first arrived, everyone else was in the same boat and felt as nervous as she did, but she soon settled into life there. She has since become the Assistant Director for the Oxford Girls Improvisational Comedy Group and is also a female welfare representative for her college. The girls found the talk to be extremely informative and all thanked Sophie for her valuable knowledge – perhaps they will be seeing her along the corridors at The Queen’s College, Oxford in the coming years!